The Cold War may have ended over twenty years ago, but it's an open secret that the US and Russia continue to spy on each other. The uncovering of a Russian spy-ring three years ago in America demonstrated that for the SVR (Russia's CIA equivalent), old habits die hard. This week showed that the same holds true for the CIA, when on Tuesday 14 May 2013, the FSB (Russia's internal security service) announced they had arrested Ryan Christopher Fogle, third secretary at the US embassy in Moscow for attempting to recruit Russian citizens as spies. Fogle had allegedly written letters and placed telephone calls to potential agents offering them up to one million dollars for their services. The US State Department declined to publicly comment on which government agency Fogle works for or on the allegations of spying. Fogle's arrest was filmed by the FSB and shown on Russian television. In the video [ru], Fogle is seen in an unconvincing blond wig and baseball cap, which are then removed by an FSB agent before Fogle is frogmarched into a waiting car. 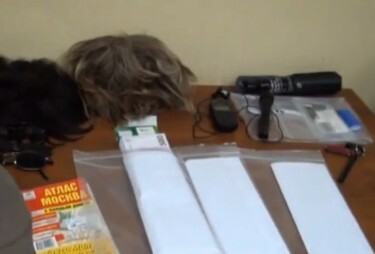 Fogle's “spy-kit” (which included two wigs, sunglasses, a compass, a cheap Nokia phone, an Atlas of Moscow, a Swiss army knife and several envelopes of 500-euro notes) is then displayed for the cameras. Later in the video, Fogle and what appear to be three of his colleagues from the Embassy are given a dressing-down by a pixilated FSB agent. In a manner strangely reminiscent of a school headmaster scolding wayward students, the agent expresses his shock and disappointment at Fogle's attempts to recruit Russian citizens, in light of the recent close cooperation of Russia with American intelligence agencies in the wake of the Boston Marathon bombings. Tweeter user Timque [ru] also took a dim view of Fogle's spycraft. Somewhat surprisingly, a much more charitable appraisal [ru] of Fogle's equipment came from popular Russian tech blogger Eldar Murtazin [ru], who pointed out the pitfalls of using advanced gadgets in the world of espionage. Начнем с самого противоречивого предмета в глазах обывателей — обычного атласа Москвы и дорог с указанием каждого дома. В век высоких технологий, когда у каждого в телефоне есть навигация и хорошие карты, это выглядит анахронизмом. А теперь давайте представим специфику работы агента, когда он не должен оставлять следов, в том числе и цифровых. Я плохо представляю себе агента, который прокладывает путь к тайнику или месту встречу в Google Maps и затем сохраняет маршрут. Этот агент должен быть конченным идиотом. Равно, как мне сложно представить как сообщить о месте встречи в электронном виде, это дополнительный риск […] Поэтому можно долго ворчать, что разведчикам чужды новые технологии, но это не так. Эффективный способ не оставлять следов, не использовать программы навигации. Let's start with the most controversial item in the eyes of the average person: the common Moscow road atlas with the adresses of all the buildings in it. In the high-tech era, when everyone has a phone with GPS and good maps, it seems like an anachronism. But now consider the specifics of an agent's work, when he can leave no traces, including digital ones. I can't picture the agent who looks up the way to a secret location or a meeting place on Google Maps and then saves the route. That agent would have to be a complete idiot. Similarly, it's hard for me to imagine sending information about meeting place in electronic form, this is an additional risk […] So you can whinge all you like about intelligence agents shunning new technologies, but it isn't the case. An effective means of leaving no traces is not to use GPS. Nossik went on to claim Fogle's alleged letter [ru] (written in awkward if grammatically correct Russian) looked like “Nigerian spam run through Google translate”.